Lightweight and easy to handle extruded aluminum chocks. Also available with a 36″ high handle and/or sign. These Rail Chocks fit most standard size rails. Double side flanges keep chock(s) on track. Four hardened steel spurs, located on the bottom side of the chock, are used to maximize a non-slip positive grip. Handle projection 36″. Handle height is 14″. The support legs on some models are used to balance the flag rail chocks and are adjustable up to 14″ in height. Aluminum “Chock Your Wheels” sign is visible from both sides. All welded steel construction provides for durability and long life. High-visibility safety yellow finish. Constructed of reinforced rubber to provide a sure grip on virtually any surface. Curved surface contours to fit tires. Rubber resists tearing, abrasion, ozone weathering, etc. Functional design is durable in all weather conditions. 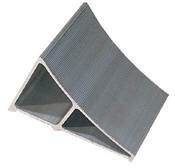 The Airline Chock is suitable for small and large aircraft. Includes a 36″ polypropylene rope with handle and reflectors connected to chocks. A) SWC-22 – Rugged all welded construction. Works in mud, sand or concrete. B) MS-15 – Features grip slot for easy pick up and positioning. C) SSC-17 – Slope design contours to truck wheel. D) FAB-8 – Textured treadplate to provide maximum traction. E) FAB-10 – Open face radius allows chock to be used with any size tire. Includes chain. F) FAB-11 – Formed chock utilizes a saw tooth bottom for traction. G) GWC-10 – Serrated steel chock, grate style;14″ Deep Including handle, galvanized finish, includes positioning handle with grip. is fastened to the chock with cold shut. Ergo-Handle – Ergonomically designed to make it easy to move wheel chocks in and out of position under trailer wheels. Reduce the risk of back, knee, and foot injuries. Factory installed only. Yellow powder coat finish. Not recommended with Urethane Wheel Chocks. Sticker measure 11¾”W x 9¾”H.